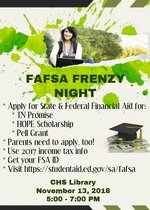 Central High School will be hosting a FAFSA Frenzy Night on Tuesday, November 13th from 5-7 PM in the CHS Library. This free event is for both seniors and their parents/guardians to assist both of them in applying for financial aid, such as Tennessee Promise, HOPE Scholarship, and the Pell Grant, to attend college or a vocational school. Seniors and parents/guardians will need to bring their 2017 income tax information.